Tennessee's junior Thorpe award winner has achieved "folk hero" status for Vols fans. KNOXVILLE -- Before Eric Berry came to the University of Tennessee, he was widely regarded as one of the nation's best high school football players. Three years later, the safety has securely established himself as one of college football's best players. By virtue of his Thorpe Trophy award this week, he at least is recognized as the best defensive back. But his UT career almost certainly will expire after the Dec. 31 Chick-fil-A Bowl with a 23-15 or 22-16 record. If his junior season is his last, he will not be part of any national or Southeastern Conference championship teams. He has not accomplished everything he intended on an individual or team level, but many consider him one of the best players in the proud program's history. "I've been watching it for 52 years, on a consistent basis since about 1966, and studying it back to 1891," noted UT football historian Tom Mattingly said Friday. "You get in trouble sometimes comparing people across the generations, and there's been so many great players, but Eric Berry's right up there with the best of them." And perhaps only one Volunteer stands above Berry on the popularity scale, Mattingly added. "There's been nobody quite like Peyton Manning or quite like Eric Berry," said Mattingly, who has written several books and actively blogs on UT history. "Peyton and Eric would probably be No. 1 and No. 1A, and Al Wilson would probably be No. 2, and Jack 'Hacksaw' Reynolds would probably be No. 3. "Eric's right up there with Peyton as a folk hero. You always get in trouble when you compare people to Peyton, but in terms of somebody that's absolutely a folk hero, Eric's got his own cheer in the stadium and has had it for three years. You have to be really special to get your own cheer in the stadium, especially as a defensive back." Berry has never been a typical defensive back, and not just because he's lined up at practically every defensive position other than tackle. The son of former UT tailback and captain James Berry, Eric started the first game of his college career and was a Freshman All-American. He was named a team captain the following preseason -- an unprecedented title for a sophomore. He responded with one of the best defensive back seasons in college football history, and he's been placed on several All-America teams this season despite playing a different role, closer to the line of scrimmage and generally being avoided by quarterbacks like he had swine flu. "A lot of times on film, you can watch people point him out before the snap and make sure they go to the other side of the field," UT junior defensive end Chris Walker said. "It's pretty funny." It's also ineffective much of the time, Vols junior wide receiver Gerald Jones said. "You can try to avoid him, and you can throw away from him, but he's still going to get near the ball before the play is over," Jones said. "His range is ridiculous. He's just a really smart guy, and he's a really great athlete. "He's the best DB I've ever gone against, period, and he makes me a better player." But big plays alone don't make a folk hero. Production on the field is perhaps the biggest key, but actions away from the field also go a long way toward separating legends from stars. In a media era when even the most seemingly polished celebrities often have their flaws exposed, not even a small negative rumor about Berry has surfaced. He does well in school, and he'd avoided anything even remotely approaching trouble off the field. As first-year Vols head coach Lane Kiffin said earlier this season, "Eric just gets it." "It's not just about the football with Eric," athletic director Mike Hamilton said. "He's everything you want a student-athlete and a young man to be, and we're obviously very proud to call him ours." Berry's public persona has never strayed from humility, either. 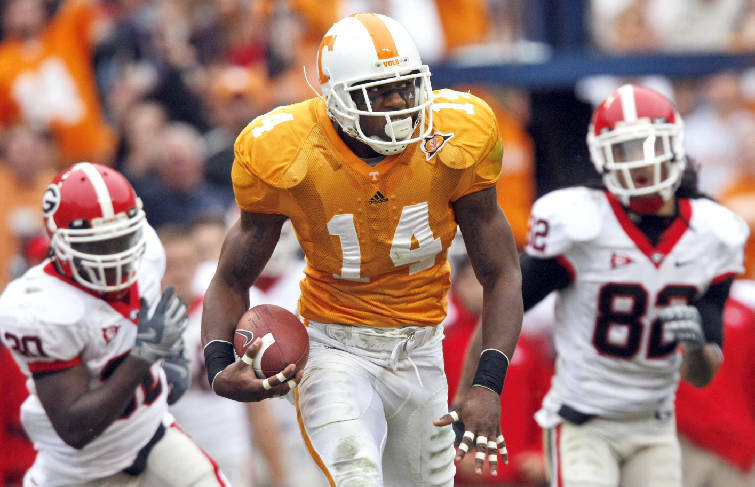 In the immediate aftermath of his first big play as a Vol -- a 96-yard interception return touchdown against Tim Tebow's Florida Gators in 2007 -- he shrugged off questions about the moment by saying he'd simply evened the score from allowing a touchdown pass over his head earlier in the game. Tebow has made multiple references to Berry being the best defensive player he faced, and the superstars again traded big blows in the Swamp this season. Berry dove in front of a receiver and snared an interception inches from the turf, and Tebow probably got the better of an open-field collision between the two later in the game. But the bottom line, as Berry openly states, is that "(Tebow's) teams keep getting the best of us at the end of the day." The Vols haven't beaten archrivals Florida or Alabama in Berry's career. The Gators have won a national championship in that stretch, and the undefeated Crimson Tide will play for one next month. Manning never defeated Florida, but he left Knoxville after the 1997 season as an SEC champion. Wilson, as a middle linebacker, fought through painful shoulder injuries the next season in helping the Vols go undefeated with a national title. "Just being compared to a lot of the greats up here, that's something special to me," Berry said. "I still don't really feel like I've accomplished as much as those guys, but at the same time, I'll take that compliment. "But there's still a lot of work to be done to reach the level where people like Peyton Manning and others are." Mattingly said that attitude has lofted Berry into the rarefied air of UT legends. "Tennessee fans really like a humble hero," Mattingly said. "That's the kind of thing that really endears him to people. He could sit there all day and tell you all about the game-changing plays he'd had, but he focuses on the things he needs to do better." UT redshirt freshman middle linebacker Herman Lathers said Berry's humility was a huge, initial shock. "When I was being recruited here, I watched Tennessee a lot," Lathers said. "Watching E.B., man, I just admired him. And once I got here, I was a little bit surprised at the way he carried himself. He acted like he was just one of the guys, and he still does. "Honestly, being able to start on the same defense as him is a big honor for me. I can always say I started on the same defense as Eric Berry, and that he helped me get better every day." Berry admitted Friday night that he is "leaning toward leaving" UT after this season and declaring for the NFL draft, but he has maintained all year that it won't be an easy decision. Both of his parents lost their jobs during the nation's recent economic downturn, and a new collective bargaining agreement could drastically reduce the NFL's rookie salaries by the next year. Manning shocked many by returning for his final season -- he was considered by some the top overall prospect as a junior -- but Berry's family doesn't have a similar family fortune to gamble. Berry also plays a much more injury-prone position than Manning, and speed and agility lost from a leg injury would be much more problematic for a safety than a pro-style quarterback. Berry admitted it would be "really cool" to leave UT as an SEC or national champion, but though he'd never admit it, even his presence wouldn't make next season's Vols championship contenders. UT will start spring practice with no proven quarterback, no proven tailbacks, one proven offensive lineman and several new defensive players. There's also the undeniable evidence that Berry will be a hot commodity in the draft. Scouts Incorporated considers him this year's top overall prospect, and longtime ESPN guru Mel Kiper ranks him No. 3. "I think he's the best player in college football, and he might be the best overall prospect in this class," draft analyst Todd McShay said last month. "He has all the physical tools, and he's a smart, high-character guy who works hard and won't give you any problems. "He'd make any team better." Still, Berry claims he will continue carefully considering both options. He has spoken with several former Vols who stayed for their senior season, and several who didn't. He hopes to speak with several others, too, and meetings with Kiffin and the coach's dad, UT defensive coordinator Monte Kiffin, also will way heavily on his mind. "I've had a lot to think about, and I haven't made a final decision," Berry said. "There's pros and cons in every situation, so I just have to talk to as many people as I can, weigh it all out and go from there. And honestly, it wouldn't be fair to the team for me to spend all my time thinking about this when we've got a game to play, and we want to finish the season on a big note." Lane Kiffin said he will "support" Berry's decision, either way, and the door will always be open for him to come back and visit. "I think he's already an ambassador for our program by the way that he competes, by the way that he practices and by the way that he mentors our young kids," Kiffin said. "He will continue do that in the future. He's going to be a phenomenal player for someone, and possibly the face of someone's franchise, because he's that type of personality, and that type of kid." The head coach joked earlier this week that he'd "given up hope" for Berry's return, but he added with a straight face that staying for a senior season isn't always the best decision. Monte Kiffin, a longtime NFL defensive coordinator, agreed. "If I was still in Tampa, and we had the first pick, you better believe I'd want to take Eric," Monte said. "Of course, if we had the No. 1 pick, we probably would have been pretty bad the previous year, and I might not be around to ask for him. But seriously, I'd want to take him with any pick we had in the first round. I mean, my gosh, what can't the guy do?" Berry can't easily say goodbye to the Tennessee family he was born into, for one. "Things change, people come and go and all of that, but Tennessee has always been a special place, and it always will be," Berry said. "It's a big part of my family, for real. The fans here still know my dad and always want to talk to him and shake his hand and stuff like that. I hope I can come back when I'm his age and show my family the same thing. "I love this place, and it will be hard to leave whenever that time comes. But I'll always be a Tennessee Volunteer, and I'm proud to say that." Other contacts for Wes Rucker are www.twitter.com/wesrucker or www.facebook.com/tfpvolsbeat.